My time in Lhasa is fast drawing to a close. It’s been a wonderful and unique experience to be amongst all the pilgrims. The winter is a good time to visit Tibet. Okay it’s cold – just a couple of degrees in the daytime and freezing at night, but the climate is dry and the days are generally clear and sunny. Best of all though, there are hardly any (non Chinese) foreigners here. I’m hoping that you might have seen the epic British film from which the title of this post comes from. It’s Kipling fiction of course, but there have been several moments during my stay when I have really had the sense of just such a mythical place. I have had to remind myself that I have no lucky arrow in my bag, or an all seeing eye pendant around my neck. This is not actually that surprising, as parts of the monasteries and palaces here date back to before the 7th Century. The place feels completely untouched by the progress of time. 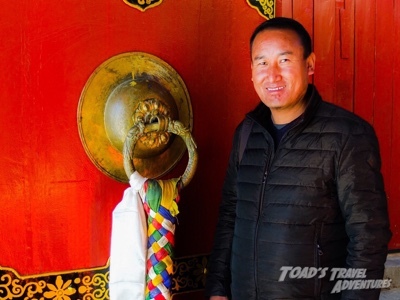 I have had a brilliant guide here in Tibet. His name is Tenzing. You have to have an official guide to get the permit to travel, but I think it has really improved the quality of my time here – there is so much to learn. Tenzing is “Mr Tibet” and he makes a real effort to show me everything. Occasionally this goes a bit too far, and I spent some time one afternoon being accidentally locked in a room in the Sera monastery. Our “escape” had a slight Indiana Jones feel about it. 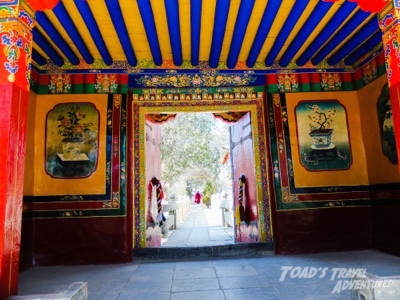 Lhasa is one of those places where the sense of place and history is such that it really touches you. It’s history needs careful explanation, and Tenzing has been great at this. 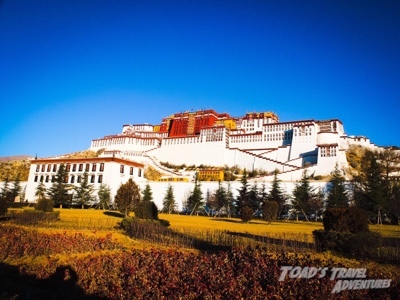 The Potala Palace looks amazing at this time of the year. I started my ascent of the many hundreds of steps at around 10am on my final day in Lhasa. This has been deliberate to give myself the best chance to acclimatise before attempting the climb. Tenzing keeps telling me not to push myself too hard, and we stop about every five minutes to allow me to recover my breath. Some of the pilgrims have the same problem as me, whilst others (I assume from the mountains) just skip past. After about an hour we reach the top of the religious part of the palace (the red bricked area in the photo above). Inside there are hundreds of people giving offerings at each of the shrines – and there are lots and lots of shrines. There is money scattered everywhere. 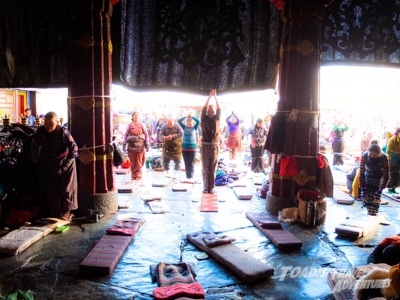 The pilgrims exchange their Kuai notes for thick bundles of near worthless “Jiao” notes, and this enables them to proffer money at every deity they see – in exchange of course for good fortune in this life and the next one. Tenzing knows the place like the back of his hand, which is just as well as I would be hopelessly lost in moments without him. Inside the dark wooden chapels of the palace we peer through the smoke of freshly made juniper incense and take in the remarkable stupas and shrines, most made of gold and precious stones. The pilgrims are mesmerised. Monks and holy men chant, offer prayers and generally supervise the process of receiving the offerings. He tells me that only 700 individuals are allowed entry each day and tickets have been issued to us in advance. Today it is 696 Chinese pilgrims, myself, Tenzing and a couple of Americans I spot outside, who are dressed like climbers. As we leave one of the galleries a monk with a lady follower approaches Tenzing. Tenzing has an amazingly polite and respectful way with anyone he meets. He nods his head from side to side and smiles at the end of every sentence. There is a lot of nodding and smiling going on in this conversation. He tells me that the monk notices that I wear glasses, and would I like my vision restored? I think about this for a moment, but it becomes clear this is not a service one declines, so I follow him to a special mandala where with an offering is made and a blessing is given. I will let you know what my optician says about my eye sight when I next have a check up. No photography is allowed inside any of the palaces or monasteries, so I’m really sorry not to be able to share what this looks like. Lhasa is at 3650m, and I have had no problems acclimatising. After the Tangulla Pass it feels quite forgiving until you actually try to do anything – when you have to stop almost immediately and take a break. My hotel is used to dealing with people who live at more modest altitudes, and offers an oxygen lounge for people to recover in. 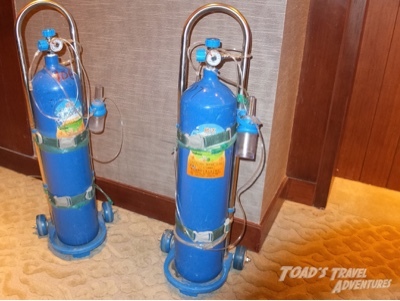 It also has pure oxygen cylinders available on room service. I have declined both as I feel I am dealing with things well “naturally” – albeit with the help of a bit of Diamox. The food has been interesting and very yak based. It seems to be the “go to” ingredient of many Tibetan dishes. I have enjoyed yak steak, even spicy yak pizza, and of course yak butter tea. I have given my final offerings, made my wishes for world peace and safe onward travel, and tomorrow I’m rather sad to be back on the train – destination Guangzhou. It’s with some trepidation that I get back on the rails, as I’m feeling like I have had quite enough train based hardship this trip. But I only have one more “tough” journey to make, one that will cover nearly 5000 km in around 54 hours. So stiff upper lip, and as Shackleton would say “keep on going”.